Click here to watch videos of the authors talking about Assessment Training Institute resources! Click here to take a guided tour of the Second Edition! Each chapter is designed to teach a clear and straightforward set of learning targets. Each chapter ends with practical classroom-application activities aligned directly to the learning targets for the chapter. The book uses Common Core State Standards as the basis of Mathematics and English Language Arts examples and includes information on how to deconstruct the Common Core State Standards into manageable classroom learning targets. 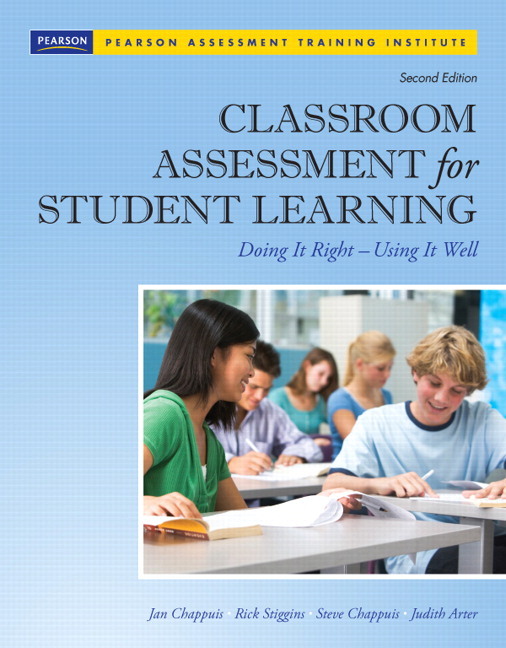 Each chapter offers a more comprehensive treatment of formative assessment practices, including detailed information on how to offer effective feedback and how to prepare students to self-assess accurately. Each chapter provides an expanded range of grade-level examples of key concepts and activities. Each chapter includes frequently-asked questions, identifying common misconceptions with advice on how to avoid typical problems. Anecdotes from classroom teachers describing how they have changed practice as a result of studying and applying CASL principles are woven throughout the text. 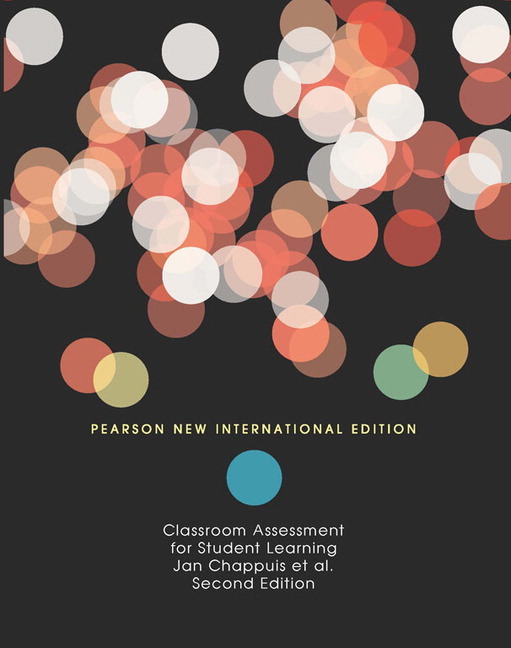 The assessment methods chapters include streamlined instructions for developing each type of assessment along with easy-to-use instruments for evaluating assessment quality. Updated information on grading now spans two chapters and includes a step-by-step process to avoid typical grading-related problems. The book is formatted for either independent or learning team-based study. Jan Chappuis has been an elementary and secondary teacher as well as a curriculum developer in English/language arts, mathematics, social studies, and world languages. For the past 20 years, she has written books and developed workshops focused on classroom assessment literacy, presenting both nationally and internationally. She is recognized as a national thought leader in the area of formative assessment for her work in translating research into practical classroom applications. She currently works with Rick Stiggins at Pearson Assessment Training Institute in Portland, Oregon. Chappuis is author of Seven Strategies of Assessment for Learning (2009), Learning Team Facilitator Handbook (2007), and co-author of Creating and Recognizing Quality Rubrics (2006), Classroom Assessment for Student Learning: Doing It Right–Using It Well (2006), and Understanding School Assessment–A Parent and Community Guide to Helping Students Learn (2002). Stephen Chappuis brings a strong background in educational administration to Pearson ATI. His leadership experiences include serving as a junior high principal, a senior high principal and executive director responsible for supervision of schools and principals. As an assistant superintendent for curriculum and instruction, he implemented a standards-based instructional program that included comprehensive assessment plans with policies and professional development in classroom assessment. At Pearson ATI, Stephen works with educators to help establish balanced and effective local assessment systems. He is also responsible for our leadership for excellence in assessment program - professional development for school leaders and policy makers, and is the co-author of Assessment Balance and Quality: An Action Guide for School Leaders, 3/e. Richard Stiggins founded the Pearson Assessment Training Institute (ATI) in 1992 to provide much-needed professional development in assessment for teachers and school leaders. Pearson ATI can help assessment users at all levels learn how to (a) create high-quality assessments, and (b) use them in the service of student success. The most unique feature of the ATI philosophy remains our advocacy of and professional development in "assessment for learning"; that is, the use of student-involved classroom assessment, record keeping and communication to promote success for all students. The Pearson ATI programs, materials and services in classroom assessment for student learning are specifically designed to draw teachers and administrators into local learning teams to master principles of balanced assessment and assessment for learning. 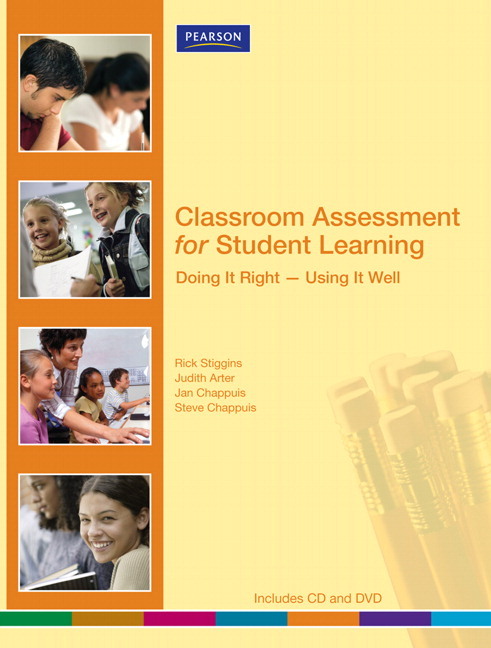 Richard is the author of numerous books, articles and papers on assessment practices in the classroom and its impact on students and student success. Judtih Arter is a nationally recognized expert in performance assessment, whose background includes statewide writing assessments, development of large-scale and classroom-based assessments for competency assessment and development of district performance assessments. Prior to joining Pearson ATI, Judith directed Northwest Regional Educational Laboratory's (NWREL) assessment unit. She has written extensively on performance assessment and rubrics, and is the co-author of Creating & Recognizing Quality Rubrics.